The Incredible Hulk has always been part of American culture (however geeky some might deem it) for many reasons. Whether it was his oh so natural green hue or his very chic tatters that have that pre-worn appeal that many hobos and drifters could identify with, but his severe anger problems were probably what catapulted him to the front of the superhero pantheon. With a Neanderthalic grammatical utterance of, “HULK SMASH!” we could all identify with him when we just wanted to rip our clothes off and go crazy when the life is getting us down (maybe less of the former than the latter, actually). 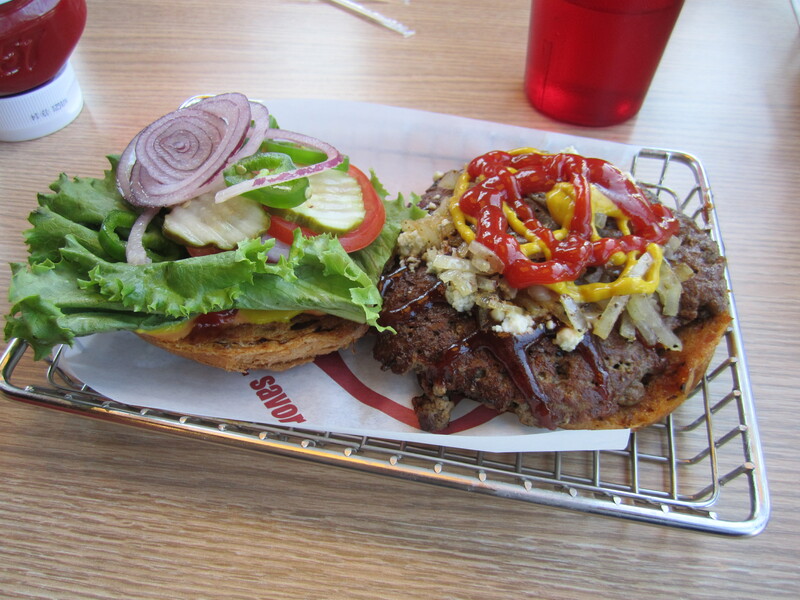 What I’m trying to get is that, I definitely went crazy for Smashburger’s food sans the searing rage of my aforementioned friend. This small and smart establishment has locations all over the United States, but the one I visited is located at 2425 W 75th St Darien, IL 60561. Even though their sign outside looked oddly like Gamestop’s, I walked into a nicely decorated restaurant that had a very casual vibe going for it. The staff was very attentive and even offered to explain any questions we had with the menu or the company in general. I ended up ordering the build your own burger with the Big Smash option which is a full 1/2 pounds of black Angus beef that is freshly prepared in the kitchen. As for the ingredients, I definitely went all out as always with my options as I managed to create a souped up burger with the following ingredients: a spicy chipotle bun, lettuce, tomato, red onion, grilled onion, kosher pickles (Shalom, y’all! ), jalapeños, ketchup, mustard, spicy chipotle mayo, bbq sauce, buffalo sauce, and blue cheese. All of which ended up looking like a monster of a burger that the Hulk would identify with, slightly odd-looking but a good one at heart. Upon sinking my teeth into this beefy leviathan, I knew that I had made the right choice with going with the large burger and not the other options on the menu like the various salads, chicken sandwiches, or specialty burgers. The beef was tender, juicy, cooked to perfection, but did not overpower the rest of the ingredients. The spicy chipotle bun was something that I had never seen before, but it certainly made an impact on the overall flavor of the burger because with every enjoyable chomp, there were subtle smoky/spicy whisps of flavor caressing my tongue. Cheesewise, the blue cheese was surprisingly measured out to support the other players in the sandwich; all of which surprised me because most restaurants slather their blue cheese on burgers like it’s going out of style (not always a bad idea), but one can have too much of a good thing sometimes. 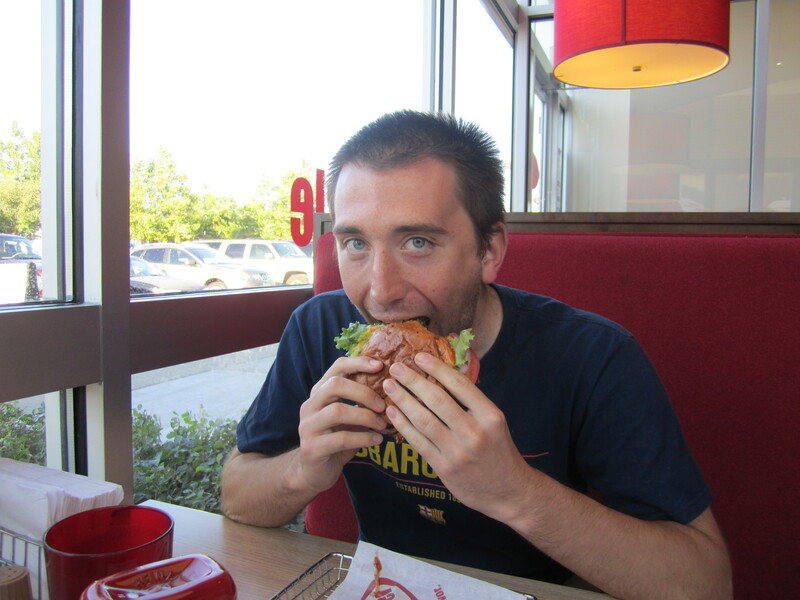 The one other element of the burger that definitely made me stand up and give a rousing ovation was the jalapenos. Now, I love those “Southwest/New Mexico/Insert general burger name invoking a capsaicin nightmare” burgers, but I’ve found that the jalapeños on these burgers are soggy and just mush into the general melange of ingredients. 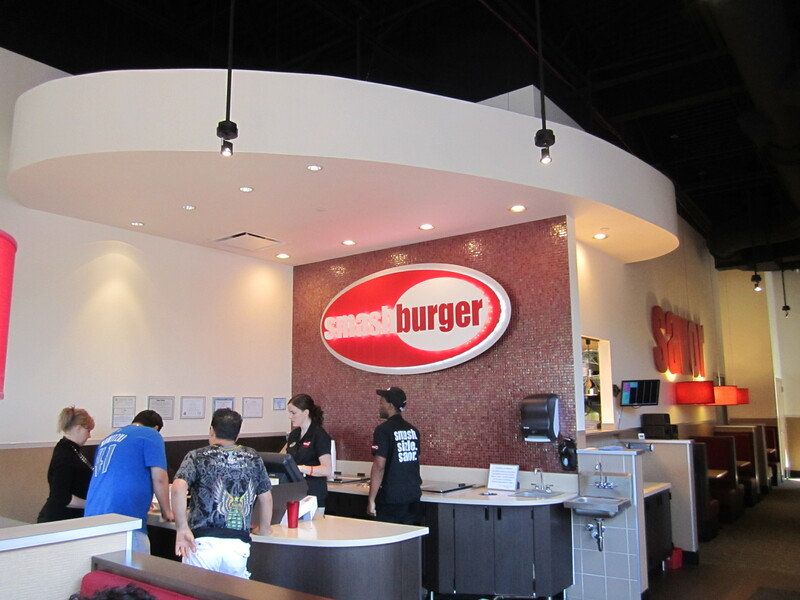 This was not the case with Smashburger. The jalapeños on my burger were a lush, verdant green like Señor Hulk, looked to be freshly hand chopped, and provided a satisfying crunch and a spicy peck on the cheek with every bite. As always, my appetite had not been satiated, so I decided to get a side that I’ve never tried before. The fried pickles were beckoning me, but I decided not to go the Snooki route this time (though you must try them if you ever have the chance). Instead, I chose the Smashfries which were french fries tossed with garlic, rosemary, and olive oil. These golden, finely julienned potatoes had me at garlic. 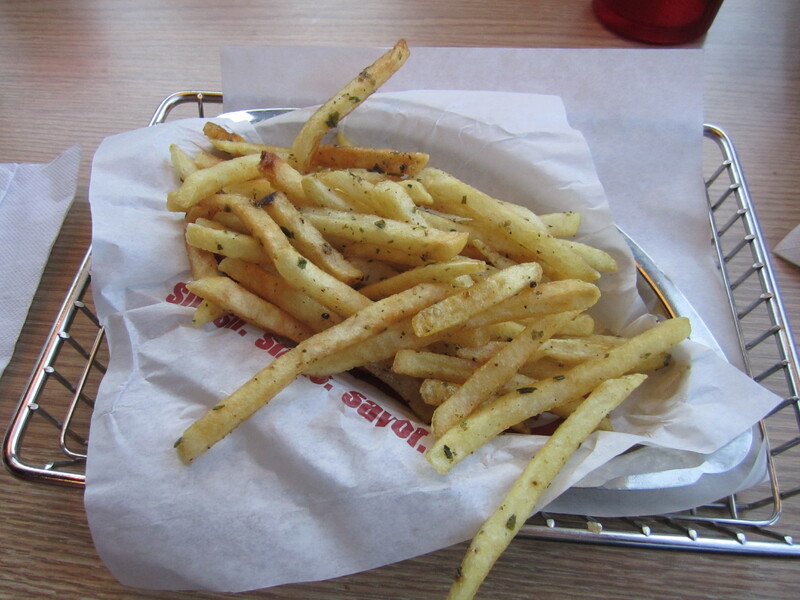 They did not disappoint because they were not too overpowering with the garlic, and thankfully the fries were fried to perfection with a light semi-crunch as I plowed my way through the mini-basket (way better than the over-salted/over-seasoned Five Guys fries, I think). For all those who enjoy a bit of spice in their food, I’d recommend trying their Cholula hot sauce on these fries to make a new American favorite that is mixed with Mediterranean ingredients and a little Latin panache. 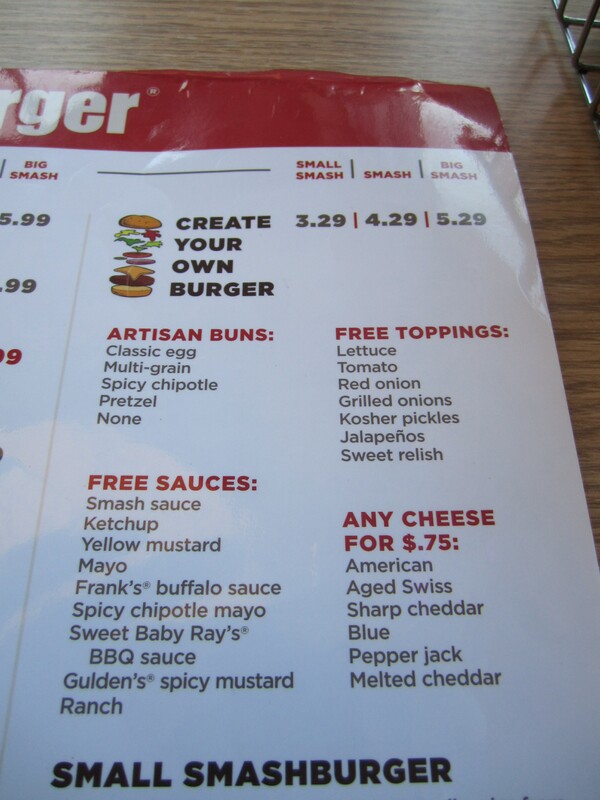 Posted in American Cuisine, Burgers, Chain Restaurants and tagged America, Beer, Burger, Chicago, Darien, Food, Fries, grill, restaurant, Reviews, Smash, spicy. Bookmark the permalink.